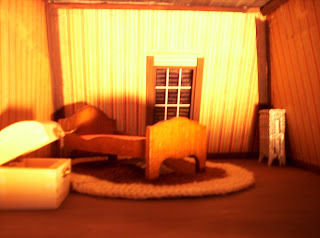 A blog about the creepy* dollhouse I am building. *And I mean that in a good way. I bet you thought I was gone for good, huh? Nope,nope nope! I'm back,in a new ( old ) house; one with a "Gabby House" already built in! Ok, so it's the spare bedroom upstairs, but it's big enough where I can now do my minis and crafts all year long; no $400 electric bills, no long trek outside in the cold & snow, and yes, this room is also known as "The Gabby House". house...OY! And actually, even the summer afternoons were waay too hot out there. I have been in this house since the first week in June, but until now TGH was so cluttered with dollhouses, dollhouse furniture, boxes of craft supplies, and empty bookcases waiting to be moved out into the hall, that there hasn't been any activity with my hobbies to speak of. However, I knew it was all close at hand and if I had wanted to start a project at any time, I could have! 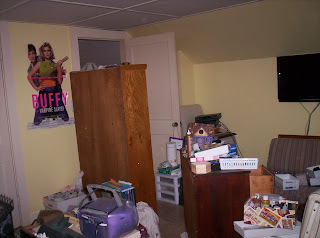 Fortunately, I've recently been able to re-distribute a lot of stuff into the spare bedroom and the hall, which freed up space to organize the remaining stuff. It feels just wonderful to be able to be amongst my minis and crafts again! You do not know how depressed I'd been in that last year in Framingham. It was awful! 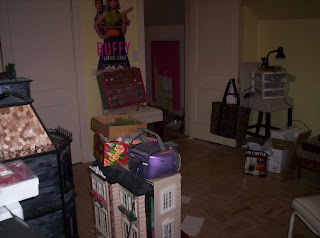 Here are some photos of TGH as it has been since I moved in, and then just a few days ago after cleaning out some things. Note missing bookcase in bottom photo. It now is just around the corner in the hall. 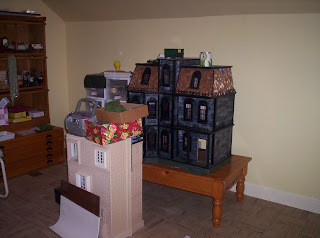 Next stop: where do I position the Addams Family House in the room? Gina, I know you have yours on rolling kitchen carts, but this behemouth is sooo big, if I did that, I'll have to 'fuse' two carts together! ( My carpenter says he can do it.) I want to make sure I have enough room around the base of the house that I can landscape the yard with Addams Family-appropriate landscaping! maybe I'll just keep it stationary, but with a wide enough area to walk completely around it. We'll see. Hi, Haven't seen me for a while here, huh? That's because I have been wrestling with my thoughts-mini tho they might be! 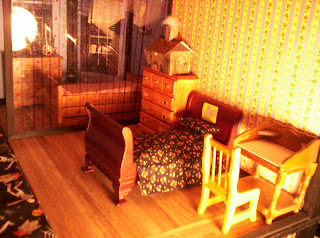 You know the story... years ago when I was in my early 2o's, I got an idea into my head that I would love to build a dollhouse...someday. 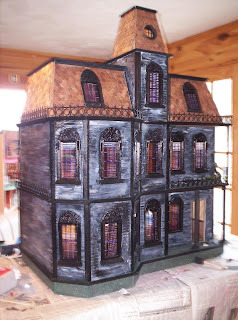 I didn't want to build just any dollhouse, but one with a little bit of a gothic persona. I waited a long time to do it, and then one day about 4 years ago I found a house that I liked; that I thought would make a good "Addams Family" house. 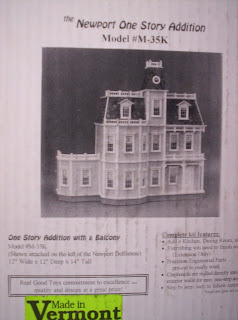 If you've been reading here for a while, you know it was The Newport, from Real Good Toys. Along the way, I really 'got into' minis. They are coool, fun, and definitely keep your interest. I actually got a little sidetracked here and there, and played at building a couple of other things, but in the end, my grand focus has always been The A.F. house. During the past two winters it has been hard for me to continue with my mini fun. If you don't already know the problem, ( it's back in the archives someplace,) but basically, I can only work in the cottage (where my minis reside ) for about 7 months out of the year. The cottage is poorly heated, plus being a ways from my house, so my enthusiasm cools, shall we say, during the cooler months. Sadly, this last winter just about killed my interest. I was so looking forward to the summer when I could resume my mini fest, but the truth is, that I've 'Lost That Lovin' Feeling' for my minis. Try as I might, I just cannot get out to the cottage and get the spark going again. It may come back eventually, but until I find a house that has a room large enough to accomodate my hobbies, I just cannot continue. The A.F., for the most part, is 'finished' - but you miniaturists know that's not really true. I accomplished my basic goal, however, by building a dollhouse from scratch, and I'm proud of myself for getting as far as I did with it. I wish you all the most fun with your mini lives; I will continue to read what you all are up to; I just won't be participating again anytime soon. Thanks for reading my blog when you did. And thanks for the comments you made. Apparently not. The girl who waited on me was a new employeee who immediately called for the boss, ( who I think was also having problems with a couple of trainees in the glass cutting area.) My glass cabinet doors he could handle, but when I asked him about the dollhouse conservatory and explained to him what I wanted, he just shook his head as if in disbelief, and put his head down on the counter. I thought he was about to cry! I'm not kidding, either. 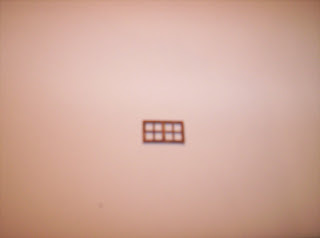 There are a few thicknesses of acrylic, and the thickest he had was too thin for the wall supports of the kit. To get me off his back, he cut me a piece of the thicker acrylic and told me to go home to play with it to see if I could get a thinner piece to work instead. I'm going to see if two thin pieces will work in each slot; like maybe two thin pieces = 1 thick piece. We'll see. I have also written a newer post that I will put up in a day or so. It will explain my long abscence. Ok, so I'm prolly not as excited as The Pointer Sisters, but I am excited. See what I got by UPS a couple of weeks ago? It's a one story addition for my AF/ Newport. But wait! When is a one story addition not a one story addition? Why, when it's a conservatory, of course. Okkk, well, in order for it to be a conservatory, it's gotta have glass walls so the sun can get in to help the plants grow, right? But my addition is milled MDF...what's up with that? I am planning to take my MDF walls down to my local glass store, and have them make up some acrylic 'glass' walls to take the place of the MDF, and then continue making the conservatory. I think it will be great fun. In all of the Addams Family 'productions'- cartoons, TV, and movies, as different as all of the houses are, they all have a conservatory. I may not be creating a one-size-fits-all, authentic "Addams Family" house, but at least the conservatory will be one thing that is authentic! Hi, I've been gone awhile, eh? Sorry...the arriving Spring, a possible new house in the form of a beautiful old foursquare, and a mild depression, all kind of hit me at once. I love the Spring; that means I can get out to the GH now. The foursquare house is lovely; I could get it for a song, but it has stairs, and my older animals and I really can't do stairs, and it would cost $$$ to update. I could prolly swing it financially, but as BB said .." Caitlin, I just don't think you're up to it." I thought about it for days before coming to the same conclusion. BB's seen me thru two house rehabs, and this one would be the ULTIMATE challenge. No, I'm going for a nice sedate little one story these days...with a built-on GH! The depression is a bummer; it's related to health issues, but I am coming out of it slowly. I'm so behind in my housework I have to catch up before I can do much playing in the GH for now. I haven't been totally ignoring my minis..see the photo? I painted one of the windows of the Gothic Mansion (!) (LOL) before I read the directions and found that it's easier to paint the pieces before you take them off the sheet. 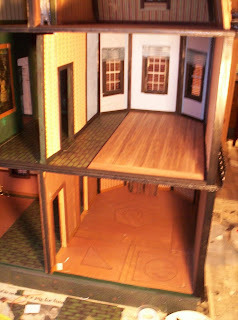 Ok, sooo, I have been trying out a few ideas on the AFH, as well as the 1:144 Gothic mansion. See my experimental placement of the furniture in Fester's, Pugsley's and Wednesday's rooms? In the last 2 photos I have the 'invisible wall' up so you get the idea of a wall, but still can somewhat see into Pugsleys room. Poor Pugsley...you never heard much about him in either the TV show or the movies. That's prolly why I chose to put him out of the way. I had no clue as to what his room looked like, so I invented it. His room is the one with the ghosties on the wall. As for Wednesday, I remember that in the Charles Addams cartoons, movies, and the tv show, her bed had an octopus on the head board, or was it foot board? I have to go run thru my films again. 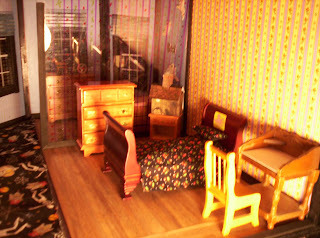 See her dollhouse? It was a printie, and I added 'smoke' aka cotton wispies! Uncle Fester's room needs work too. 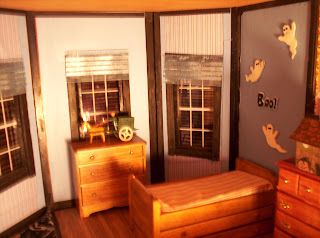 I have to paint the trunk and make up bedclothes for the bed, and get a couple more pieces of furniture in there, as well as some maps on the wall. His room is the one with the angled bed. Seriously...neither the outside of the house nor the inside is really trying to be copy of the Actual Addams Family abode; it's just to give a broad suggestion as to the type of family who lives there. I fashioned it after The Addams family because I could incorporate some of their tv & movie props into props I can use in my house. On to the Gothic Mansion...code name GM from now on. I have been wanting to start working on it, but I really waffled as to whether or not I wanted to paint it. I have never seen an unpainted specimen, as I suspect that it might look kind of plain and boring. What I'd really like to do is teeny tiny shingles-to make it a shingled house, but I'm thinking it wouldn't be a whole lot of fun so I'm sticking with paint! I've finally decided on a mint chocolate chip kind of scheme. The body will be mint green, the trim will be chocolate brown, and I might put some cream in there, too, maybe the windows inside the window trim. Sorry, no photos yet. No, of course you can't see, because there's nothing to see,... now. I'm talking about all the fine tuning I've been doing on the AFH. Before I began there were gaps, painting mistakes, and missing parts. And you may not have seen them in a photo anyway. But I assure you, they were there. And now most of them are gone! I admit I'd been dragging my feet a little getting back to working on my lovable behemoth of a house. There were so many things to do to it, I wasn't sure where to start! Plus, all my other projects are scattered around the GH, and sometimes I just can't resist a little painting here, or a little gluing there, so I don't. Resist, that is. lol. I went to Dollhouse Treasures in Braintree(Ma.) today, as I had a gift certificate that my sister gave me for Christmas. I am planning to begin seriously thinking about furniture placement within a week or two, but I really want to make sure I have all the finish work - inside and outside - done first. I'm a semi-retired mom who just moved to Uxbridge, Ma., where I am helping to improve my c.1949 Cape Cod with Feng Shui influences, as well as improving my c.1952 chassis!